Note to Old Married Men. . .
Anywho, there is another dude who is also less older, taller, married. . .and a Christian. I prefer to laugh and talk with old, tall dude because he is RESPECTFUL, never makes sexual references, and is cool. Unlike old, short dude who is ALWAYS making sexual references, complains about his wife and is sooooo immature for his age. So old, short dude comes at me like, "Leave old, tall dude alone. He is married." So, I am like, "WTH?" And old, short dude is like, "I see how you are with him." There is nothing LESS attractive than an immature man, EXCEPT, an immature OLD MAN. I did not want to hurt his feelings but I am sooo NOT attracted to old men. I enjoy their company probably due to some latent daddy issues but. . .
. . .I can't get jiggy with that! Now I feel all weird around, old, tall dude. I think too myself, Am I too nice or flirty with him? 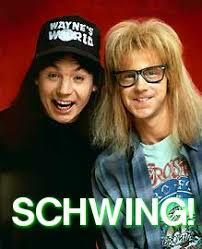 I know with guys there is little room between nice and schwing! **Side note** The two guys have the same first name. Coincidence? Hmmm. That sounds like a case of sour grapes to me. Old and insecure to boot. Don’t pay him any mind, chica. I think that short old guy is just jealous of tall old guy. Especially since short old guy is flirting with you and you aren’t paying him ANY attention. And as long as you know that you’re not being flirty with tall old guy, then you’re good! Thanks for the insight. Work politics are a trip. In reference to the short dude, as the saying goes, “there’s no fool like an old fool.” I feel you might have to get him off of you somewhere down the line. Please be very careful, Cutie Pie. I am not worried about him, but thanks for the concern. It was just a really weird moment. How uncomfortable is that now? LOL well do you think you are flirty with him at all? But if it’s totally honest politeness I don’t see what’s wrong with it. I was told once I was flirty with a guy by my roommate when I was just honestly glad to see him. I think I can be overly exuberant at times. lol. The wrong guy could interpret that as flirting.